Tri-Arc's 2-Step Mobile Steel Work Platforms are secure, movable work surfaces. Pick up one end and roll with ease. The two 4-inch casters allow for easy transport and the two 2.5-inch diameter pads add stability when in use. Tri-Arc’s Mobile Steel Work Platform is engineered and manufactured in compliance with OSHA 1910.29 and ANSI A14.7 standards. 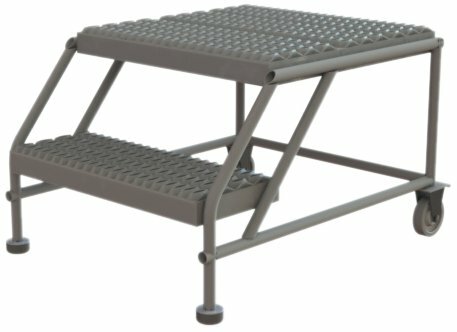 Additional features include 1-1/16-inch tubular steel construction, gray powder coated paint finish, and Grip Strut slip-resistant tread. Ships all-welded. Rated capacity of 800 lbs and made in the USA. 24-inch by 24-inch platform, 20-inch platform height, 20-inch overall height, and 31-inch overall length.